Change Your Tale… Change Your Life. Wednesday, we catch a break with the 10 of cups. The week is still busy with the Cardinal Grand Cross staying for months, but there is also some harmony. This is the kind of day you might look on the positive side or count your blessings. There are things to be thankful for and sometimes people forget. The Moon is in Virgo and Virgo is associated with daily tasks, chores, and work. This is a good time to take a break from your busy schedule and acknowledge what is good in your life, especially if you’re feeling negative or run down. Early Tuesday morning the Moon moves into its native sign of Cancer. 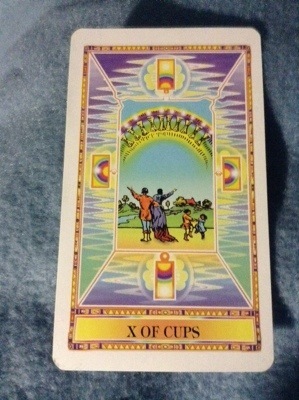 For today, we have the 10 of Cups. If you’re familiar with Tarot, you might find this funny in the way Tarot can be. Tens mark the completion of each suit and Cups are usually associated with water. Describes the full moon in Cancer, a water sign. Further, the 10 of Cups card shows a family who is happy and celebratory. Cancer is associated with family, cooking, nurture, mothers, women, the home, one’s homeland, and more. Today will be a good day. Just look at the card!